Why is it that I’m always out of pocket when the “big” news items hit? I have had limited internet access over the past couple days as I was briefly out of town. Anyway, I’m finally digging into the information that Michelle Obama announced in conjunction with the USDA and what it all means. More fruits and vegetables at lunch time — Thumbs up: Now they just need time in which to eat them! Calorie maximum on meals — Thumbs up: There was always a minimum, but oddly never a maximum. Flavored milk still okay, but must be non-fat — Thumbs down: I believe that fat is not the enemy, but instead that sugar is the problem, so I’m still upset that chocolate and strawberry milks will be allowed. Let’s have kids down a bunch of sugary milk with no fat (which helps the sugar to be absorbed slowly into the bloodstream) and you’re looking at insulin spikes. Am I wrong to worry that kids aren’t getting enough of the good fats that problem healthy brain and cell development? Sodium to decrease over a ten year period — Thumbs up: I wish this could happen a little faster than ten years… Let’s put this in perspective. My son Charlie is 3 years old and in ten years he’ll be in the 8th grade. Um, that’s a long time. The fact is that if a district is meeting the HealthierUS School Challenge they will meet the new mandatory guidelines. Of course I’m encouraged by these changes. I think we need more money to make this really go well in the fruit and veggie department. Click on the image I uploaded with this post — it’s of a “before/after” lunch menu with the new rules. The “after” menu is phenomenal, even jaw dropping. But it’s going to take a lot of creative thinking and fundraising to accomplish a menu like that. The simplicity of the “before/after” chart implies an ease that is just not there. What are your thoughts? My main problem with HFCS isn’t so much whether is more harmful or equivalent to cane sugar. I think that’s the wrong question and keeps us distracted from the real problem which is it’s showing up in places it has no business being. When it’s necessary to label your bread as “not made with HFCS”, we’ve got a real problem. Normal, everyday bread bread shouldn’t have sweeteners in it in the first place. I agree that HFCS should not be used in bread. However, I make all of my own bread, buns, pitas, etc. and virtually all the recipes I’ve made use sugar, honey, agave, or some other natural sweetner in them. “normal everyday bread” needs to have a sugar in it as it’s what feeds the yeast and makes it rise. “normal everyday bread” also needs salt to regulate the speed and which the yeast consumes the sugar. These all seem like good changes, I agree on the flavored milk, but meh, baby steps are better than none at all. Despite the improvements, which I applaud, we still don’t buy school lunch. 1) I don’t trust the sketchy meat. I believe standards for beef in school cafeterias are lower than for beef used in commercial fast food joints. Eccch. Change the buns to whole wheat til the sun sets, but if the patty inbetween is still grade z and tastes like dog food, then no thanks. 2) My kids don’t like the way school lunch food smells. It leads them to conclude that it must not taste good. I’ve eaten school food on picnic day, and I concede they’ve got a point. The smell of school cafeterias is gagworthy, and probably does more to turn kids off of food, any food, than anything else. When you’re surrounded by that smell, it makes it hard to choke down anything, even food that’s delicious and good for you. NONE of the teachers or adult personnel eat lunch with the kids, they all eat away from the cafeteria. I don’t blame them, but it also makes me wish the kids could get a reprieve from that nauseating odor, it’s such poison to the appetite. 3) As you mentioned already, waiting for school food just takes too long, there’s already not enough time to eat it. I would have LOVED to been able to drink water when I was in elementary school. I dislike the tast and texture of milk, but was forced to choke it all down or else lose recess. There have been multiple conclusive studies that have shown removing flavored milk from schools significantly decreases consumption. This may seem a small caveat to the triumph in removing it from schools; however milk is such a nutrient-dense food that researchers who studied the students’ intakes found that when the kids didn’t drink their milk, they were at very high risk for not consuming adequate vitamins A and D, calcium, protein, etc. What you have to remember is it’s only a good, nutritious lunch if it’s actually eaten, and if studies show kids won’t drink plain milk, then you can’t argue with those facts. Also, if you take a look at the nutrition facts for a Dairymens skim chocolate milk, you’ll find that the sugar content has been reduced significantly and it is still the top seller in schools that use it. Mrs. Q, your idea of kids not getting any “good fats” from the now low-fat milk options is a little flawed. Most of the fat in milk is saturated, and trust me, kids get plenty of that in their diets. Maybe a good way to encourage better fat intake would be to add fish to their lunch menus once weekly. Offering high fat milk is just not a good option. I work in an inner city school district. The argument of flavored milk has a lot of merit. White milk (skim or 1%) is normally served in paperboard containers. This paperboard does give an “off” taste. In Idaho the entire state switched to plastic containers, and there is no longer this complaint. However, environmental groups/parents are upset. People would say well recycle then; that is not that easy. The plastic containers would have to be rinsed, and then a recycling center would have to pick them up, and the company would have to not charge for this service. Flavored milk increases milk consumption in children, there are multiple school districts who can attest to this. There is really a minimal amount of sugar or HFCS in milk, and milk has many healthy benefits that juice or water do not have. Many low income families don’t drink milk at home. I would FAR rather have my children drink chocolate milk than none at all. Also, what MRS Q does not understand is school lunches are far bigger than a single district. These new sodium guidelines will take at least 10 years to implement, as vendors have to change their recipe and have it palatable. Cooking solely from scratch is not realistic for schools to do, hence some processed food will always be there. While I agree the photos of Chicago School District are not appealing I would say that they are the minority in this sense. Most school meals looks good. As far as the comment of school “proteins” being a different grade, this is false. Schools identical products as chain restaurants. Most school districts nationwide either use JTM brands, AdvancePierre, GoldKist, Lings, to name a few. These brands are also used commercially in things you can buy in the grocery store. One other thing to note, school meals cost about .75 cents to make; labor makes up the rest of the cost. Labor is not cheap. School meal revenue has to pay for labor, kitchen maintenance, new equipment etc. For schools to serve a “restaurant” meal lunches would need to cost at least $4.50. The argument is “I can do it cheaper from home”, doesn’t work as your “home” labor is free. Ammonia does not belong in lunch. I manage a high school cafeteria in California. There are a lot of regulations I do not agree with that definately need to change. I switched all my chocolate milk to non-fat this year and the students are complaining. If we do not slice oranges/apples/ anything that has a skin/ rind for the students they will not take them. Do we used a lot of processed foods? Absolutely. As far as the comment about protein was made, we do use all of those mention as well as TYSON, a very large household product name. Labor is very exspensive and we are expected to fund our own department. The increase of a whopping .06 cents will not cover a single piece of fruit. Our cheapest fruit/ vegetable serving is at least .30 cents and it is a tiny apple. How does the first lady plan on schools finding the extra $ to implement this? Sorry but she is in La La Land and needs to come back to reality. I will tell you what I have noted over the last 5 years. Students are buying any meals that are freshly prepared/ “homemade” style. What is that telling me? That they are not getting fresh or homemade meals at home. Fresh meals are labor intensive and take much longer than processed products. Nutrition has got to start at home, school lunches are NOT making kids obese. 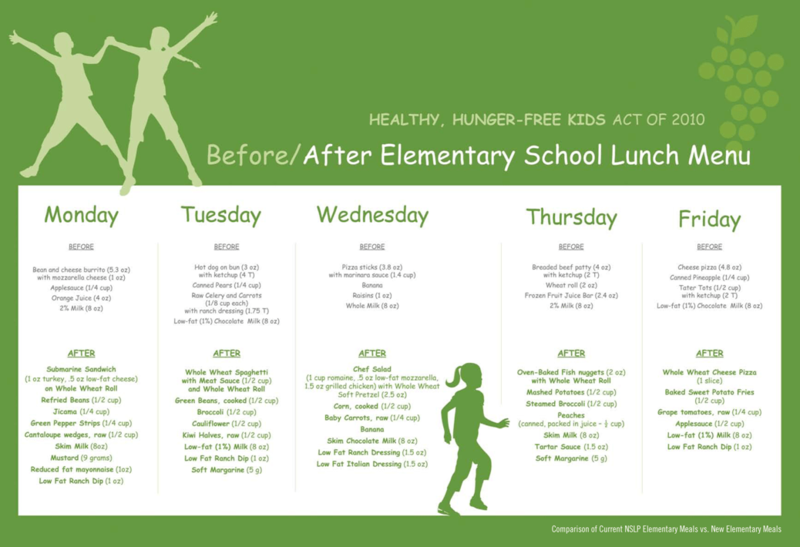 Our lunches are portion controlled and follow the selections from the USDA My Plate guidelines. What about those 20 piece chicken mcnuggets parents are buying their kids for dinner and the 500 calorie starbucks drinks? No, those dont count do they….. I agree…when I leave my middle school cafeteria and it is an early release day, all I see are kids walking down the sidewalk after school with red slurpy stained faces and hot cheetoh stained fingers…I know that these after school “snacks” cost more than the $1.80 that they should have spent on a very well balanced lunch earlier in the day….the inactivity and the junk that the kids eat at home is what makes the kids fat…Not the School Lunch Program!! You are going to trust “Jamie Oliver”, that ammonia is in our foods. Jamie is so full of himself, and only wanted one thing from “The Food Revolution”, which was RATINGS. Look at what menu items are now being offered at the schools he tried to change. The same things that were before. I agree with Certified Lunch Lady, schools use household names, Tyson etc. Second hand meats aren’t served anywhere, not even inmates. All meat has to be USDA graded. Do your research from “real” sources before you spout lies. I am not sure what you mean by “second hand”, but I am assuming you do not mean meat that was already used by someone else, but something along the lines of sub par. With that definition, I consider Tyson meat to be second hand, and I definitely wouldn’t serve it at home. Well not everyone can serve farm fresh eggs, and chicken breast. Tyson is a reputable company, and is not “sub-par” as you suggest. Do you really think schools could prepare everything from a raw state? If this happened two things would happen, first lunch prices would triple, and second food-borne illness would increase. School food service employees for the most part are not “chefs” and do not have much if any culinary experience. I don’t know of any chefs that would work for school wages, and only 25 hours a week. Err… has anyone seen Food, Inc.? Meat is BAD for you in this country, and it should be a crime to serve it anybody, much less the people who need nutrition most. Food, Inc is great — changed my life. ik i saw it its bad KEVINS LAW!!!! Food Inc is Propaganda is say the least. While I don’t work for any food manufacturer or distributor. I would hardly say it should be a “crime”. People need to understand that our food didn’t become processed overnight. Grass fed cattle, or free range chickens really mean nothing to me. They cost more, for a very similar product. Nutrition from a corn fed cow vs a grass fed cow is not very different. Hopefully someone can help me a school lunch issue. I ran daycares for a while and we used the national free luch program, along with that came guidlines on what you had to feed the children. I has been a while and I no longer no the guidlines or where I would even find them. I will start by saying my daughter is very active in school, runner cheerleader and about 5’2″, maybe a hundred pounds. She needs to eat as much as she can. My issue is my daughter had to go to lunch detention recently, as has her punishment she was only allowed to have ham and cheese on white bread, a bag of potato chips, if fruit was available a thing of fruit and a carton of milk. By the way, she does receive free lunches so I sure it was counted as a full luch as well. I have argued with the school that one its fraud because they are saying she is getting one thing and charging the state for another (not just mine but other kids as well) and two she eats lunch at like 11:00 and is so hungry by 3:00 she gets sick. The lunch that your daughter is being provided with qualifies under the current standards as a reimbursable lunch. The school is not “saying she is getting one thing and charging the state for another,” they are providing your daughter with protein, grain, fruit, vegetable, and milk servings and getting their allotted reimbursement for it. Your daughter should be allowed to have as many fruits and vegetables that she can eat. We have to control the portion size of the entrée but the fruits and vegetables do not have to be controlled. That might help her get all of the nutrition that she needs I hope this helps.